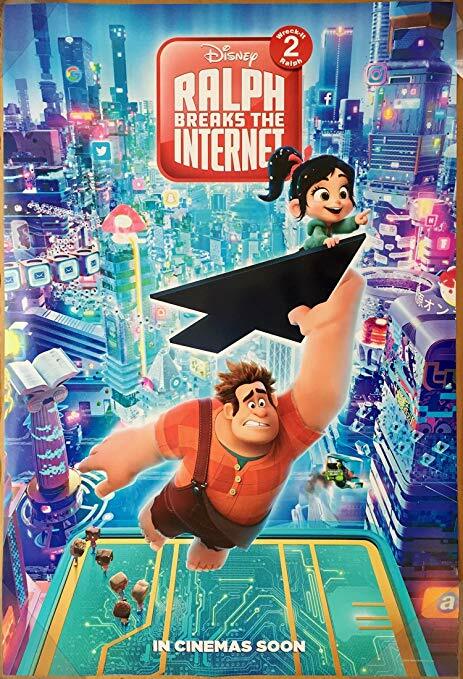 Released on November 21, 2018, “Ralph Breaks the Internet,” sends the audience into an abyss of nostalgia, bringing back the loveable duo—Wreck it Ralph and Vanellope von Schweetz—for yet another adventure. Taking place six years ahead since the first movie, ultimately making it present time, “Ralph Breaks the Internet” seamlessly ties in old characters and video game references from the previous movie, all while incorporating more modern ideas revolving around technology today— and even a comical cameo of the beloved Disney Princesses. After the wheel on Vanellope’s game, Sugar Rush, breaks, the owner of Litwak’s’ Arcade is forced to unplug the gaming machine; which ultimately results in all the characters in Sugar Rush needing to escape and seek shelter with other video game characters in the mini universe. Desperate to help his best friend, Ralph comes up with the idea to “visit the internet” through Mr. Litwak’s new plug in to find a new wheel for Sugar Rush. While entering the realm of the world wide web, the film plays homage to more relevant references in today’s society, portraying the internet as its own city, full of towers of “Snapchat,” “Ebay,” “Amazon,” “Instagram,” and more. Different than any other movie, especially for this kind of audience, “Ralph Breaks the Internet” introduces fresh motifs of insecurities and how they affect friendships. In short, when Ralph and Vanellope visit the game Slaughter Race to get some money to buy the wheel for Sugar Crush, Vanellope falls in love with not only the lifestyle of the online game, but begins to grow close with the main character of it, Shank; ultimately leading to tensions between the iconic duo as Ralph begins to become insecure, needy, and clingy— fearing that his friendship with Vanellope may be drifting away from him. In addition to this, “Ralph Breaks the Internet” does an impeccable job in creating a dynamic, unpredictable plot—mostly due to the fact that there were multiple, relatively big and important, problems within the film. Although at times there were things that logically would not make sense, overall, the film does a beautiful job of engaging audience viewers of all ages. Like almost every other childrens’ movie, the film does incorporate the theme of “friendship,” but its take on it (especially with the motif mentioned before) helps in avoiding triteness and introduces a new lesson rare to this niche. Focusing the overall lesson on letting people go and being happy for them, rather than holding them back for your own happiness, this film reminds us: “best friends don’t have to have the same dreams.” Although this is a fresh, new idea for the little kids of 2018 to obtain from the movie, it also resentates with adults and even the teenagers going off to college who watched the first one six years back. Overall, “Ralph Breaks the Internet” introduces a contemporary and shockingly real lesson for its audience. Finishing with a heartwarming, not too overly happy, ending that was able to even bring the grown man sitting next to me in the theater to tears, the film achieved being more than just another sequel movie.